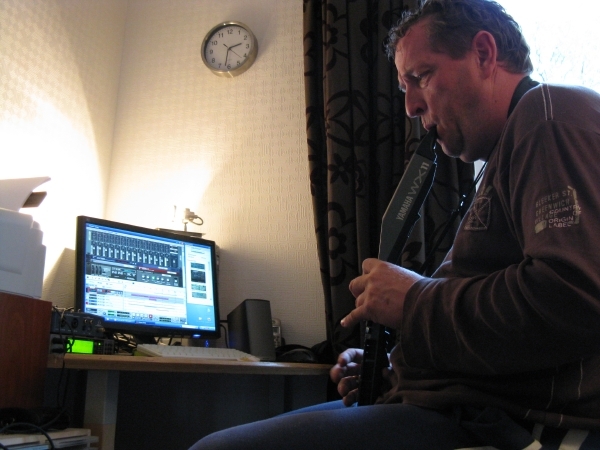 I first learnt about My Breath My Music and Ruud van der Wel at the Support Exhibition in Utrecht in 2007 – a large fair, with lots of disabled people attending. From a small corner stand music drifted towards me. My attention was captured immediately. Music is one of the most important things in my life. Always has been. I want to tell you something about it. My musical history, the “accident”, and the unachievable which turned out to be achievable after all…. I grew up in a family where organ and recorder were used as the instruments to make music. I never really tried the recorder. I tried out a few things on organ, but nothing serious. Using my brother’s text books I never got past “two sharps”. That’s where my adventure ended. When I wanted to make music, I usually sang, or imitated a saxophone. I don’t remember how, but at some point I got hold of a pan flute. With some breath training and imagination, I quickly became able to play melodies and improvise a little. The music was in my head. I wasn’t very good at reading sheet music, and playing with others never was a big success. I was doing it for myself, and I enjoyed it a lot. Changing from pan flute to flute wasn’t a big step and as soon as I had the money I bought one. I took a few lessons to learn basic technique, but mostly taught myself. I had a great time playing, sometimes a lot, sometimes a bit less, but always alone and just for the people close to me. While learning I really started to enjoy it a lot. Imitating a sax is one thing, playing one is quite something different. Changing from flute to alto sax turned out to be more difficult, because of the different breathing technique. A teacher helped me to get started, and playing my favourite instrument turned out to be possible. I continued to play the pan flute and flute occasionally, but sax was becoming my main instrument. Never before had I received a Saint Nicholas present that would change my life this drastically. I can’t remember anything from that particular day or night. Later I was told that on Saint Nicholas Eve I suddenly became very ill, something called a Critical Illness Syndrome. I was on my way to the hospital in an ambulance in no time, in critical condition. I slipped into a coma, and the doctors decided to keep me in that condition because of extremely high blood sugar levels, all kinds of other dangerous signs, and because my brain had likely been damaged. In early January 2007 my condition stabilised and I was slowly brought back to consciousness. I gradually began to realise that I wasn’t at home in bed, but in a hospital. I spent several weeks in the intensive care ward. There was lot of stress and a lot of worries for the people close to me. Then fortunately I was transferred to the nursing department because of my improved condition. Improved, certainly, but because of that the harsh reality started to sink in. I couldn’t talk. The only thing I could do was confirm or deny something by closing my eyes or moving my lips, but I couldn’t make a sound, I couldn’t hold anything with my hands, and sitting, standing or walking were all out of the question. Doctors suspected that among others things my balance was impaired. A period of getting stronger and re-evaluation, or whatever you want to call it, started. Over time it became apparent what will improve, and what wouldn’t. In other words: how disabled I would become. During this time I started to think that making music was a thing of the past. I hadn’t seen Saint Nicholas that particular December the 5th, but that night someone has taken my pan flute, flute and alto sax from me. Taken away my ability to make music altogether! At least, that’s the way it felt. That alto sax had been my best friend in the previous years. After the first period in hospital I was transferred to a nursing home until I could be admitted to the rehabilitation centre “De Vogellanden”. Slowly but surely it became apparent that I’d have three permanent disabilities. I couldn’t stabilise my body anymore so hence I’d be bound to a wheelchair. However, I could propel myself because the strength in my legs was still there. Furthermore, my speech was affected, and I had contracted Ataxia in my arms, hands and jaws. Coordinating these body parts is difficult, and involuntary movements occur. At rehabilitation centre “De Vogellanden” I tried hard to play sax and flute, but I couldn’t help myself. I was unsuccessful, because of my restless hands and problems with my breathing. One of the therapists proposed getting in touch with the Music-and-Injuries team at Friesland. This is a group of therapists and doctors from the rehabilitation centre “Beetsterzwaag” who are working with people with disabilities, and who are looking for adaptations or new ways of making music. They have a lot of experience with this, and know other organisations that might help. I travelled to Friesland, and hope returned. Enthusiastic people who believe in opportunities and possibilities turned out to be extremely important. But I didn’t make much progress on my former instruments, because I was still troubled by restless hands and breathing issues. During this period I meet Ruud van der Wel at the Support Fair in Utrecht. He was presenting his My Breath My Music Foundation, and showing how disabled people can make music (again). He’d even developed a new instrument, the Magic Flute. He mostly works with electronic instruments and equipment. I started to realise that this could be the solution. I couldn’t reliably play my “old” instruments, as breathing issues were a problem for me. With an electronic wind instrument and a few simple adjustments that could be solved. In the stand several disabled people demonstrated this beautifully. I was impressed with what I heard and after a quick chat with Ruud I left the fair. ‘If people with disabilities as severe as that are able to make music…’ I thought. Back home I immediately looked up the mybreathmymusic.com internet site. While reading and following various links it became clear what’s possible. People with various handicaps can make music again, or can make music for the first time. The musical therapist from Rotterdam helps them with that. He has all kinds of creative ideas and solutions, and supports you in the process to learn to play again. Below I’m describing how Ruud helped me after my first email to Rotterdam. I’m now playing an electronic sax, the Yamaha WX11. This is the best model for me. Aside from the various types of saxophone, I can emulate all kinds of other instruments, from piano to guitar. I was able to try out various other models as well for a period of time. Ruud helped me to select equipment like the accompanying sound module (Yamaha Vl70) and an appropriate sound card and software for my pc. 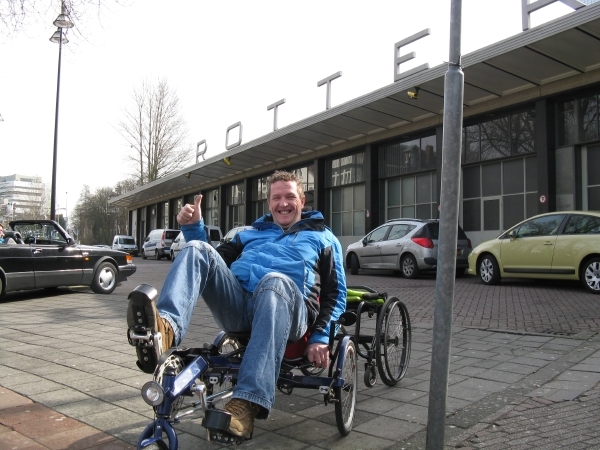 I went to Rotterdam several times and received practical instructions from Ruud. I’m still receiving extensive support from him via e-mail. Whenever I can’t find the answer myself I get an enthusiastic response which puts me back on the right track. My musical horizon has expanded enormously. Aside from playing various “instruments” I can now adapt and mix music, add rhythms and other instrumental parts etc. I’ve actually gained a new hobby. Lots of things can be found on the internet with regard to electronic music. Progress happens in stages. I’m operating on the same level for some time, and then suddenly there’s a dash forward, and everything has become better and easier than before. When I think back to the sounds I produced when I started, and how it sounds now…. I really hadn’t thought this would be possible. Being able to play, control my breathing, knowledge about the equipment…. Ruud has helped me tremendously, and he’s still doing so. With the technology, but also with his tremendously positive attitude, thanks! This has been so important for my rehabilitation, and for me to accept my new situation.